I decided to try something new and see how it worked out. Personally, I love learning how others paint and finish pieces and watching videos is even better. I think it’s fun and it also helps to see and not just read about the process. I purchased an American of Martinsville (AOM) Bamboo Style Dresser off of our local buy-sell-trade Facebook group last April. The first time I went to see it I decided not to purchase the piece based on condition and the non-negotiable price. Once I was back home I sent the seller a message to let them know I liked the piece but it required much more work than I anticipated and in order to make that work worthwhile I would only spend a certain amount (which was 40% off the asking price). After no interest for a week she told me I could have it for the price I named. Awesome, or so I thought. I brought it home and it’s still a great piece, but I put it off all summer because of all the work it needed. Then Fall came and the cold weather meant I wouldn’t be stripping or spraying the finish anytime soon (the faux bamboo-ish drawer fronts and little divots on the drawer fronts were not something I wanted to hand paint with a brush). Now that it’s February of the next year it seemed like a good time to get around to starting and then finishing this piece. This dresser has a very unique style that I have not seen before. I love the mod, space-age feel it has. The legs are neat and the way the top, back, and sides extend past the drawers is so funky it’s cool. This is one of those pieces that a lot of people look at and just don’t get, but the people who do get it, love it. I am one of those people who loves it. Since this piece will require a lot of steps like stripping, cleaning, sanding, filling, priming, painting with a sprayer, and sealing, I thought it would be fun to document the process and make videos of each part of the transformation. 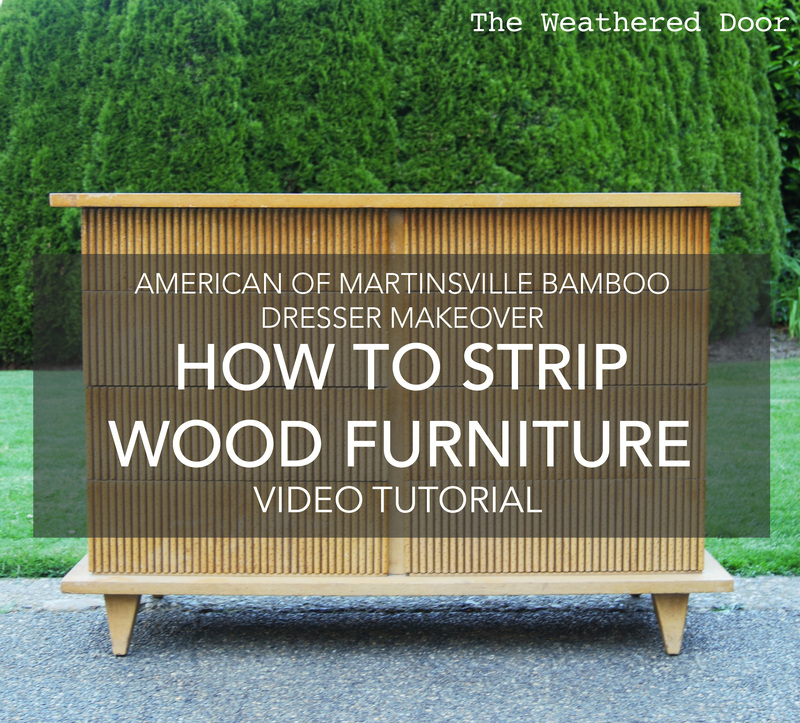 Today, it’s all about stripping this piece, but this video and post will also show you how to strip almost any piece of furniture. 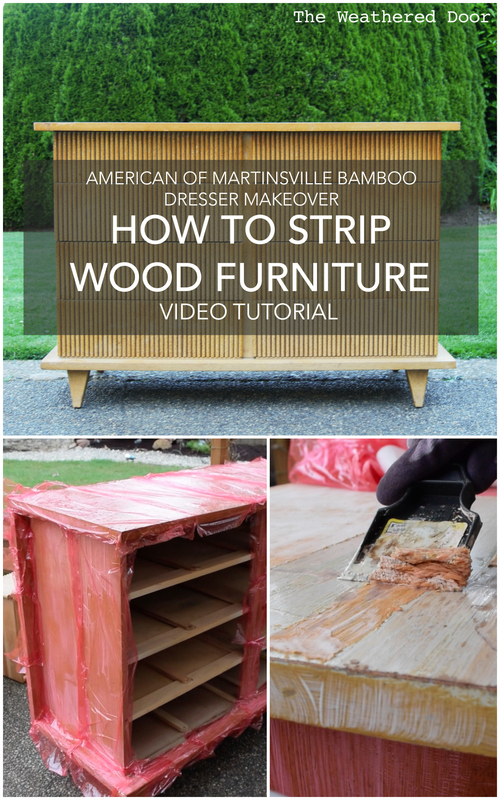 For anyone who wants to read the steps of how to strip wood furniture, continue scrolling down in this post. I chose to use Citristrip because it does not have the harsh chemical smells that other strippers do but it still does a great job at removing painted and stained finishes (the finish on this AOM dresser was white paint followed by a stain). Use an old paint brush to apply the stripper. It can be washed out and used again, but it is not a brush you then want to apply paint or poly with so don’t use a good brush with the Citristrip. Work in 1 foot sections to apply an even coat of the stripper. In the video it looks like I applied a thick coat, but I evened it out once I wasn’t holding the camera and trying to apply the stripper. 3. Wait and let the stripper do its thing. Citristrip can apparently stay wet and active for 24 hours. I don’t leave it this long, but the bottle says that you can. On this piece I left the stripper on for 1 hour. When stripping the polyurethane finish off of some wood drawers I have only waited a half hour and when stripping the old finish off of hardware I’ve only waited 10 minutes. If you have experience stripping other pieces you can guess and look at the piece to see if it’s ready. It doesn’t hurt to wait a few hours just to make sure the finish will come off. You can always test scrape a small area to see if it is ready to remove. *Do note that surfaces with multiple layers of paints and other finish may take more then one application of stripper to remove all of the finish. Try to keep the piece in a place that isn’t too cold or too hot. The sun came out after I had applied the stripper and I do think the stripper started drying on the sides a bit. Remove the saran wrap on part of the piece (I started with the top, then did each side of the dresser) and then begin scraping off the old finish using a plastic paint scraper (not a metal on as it can scratch the wood). It’s best to work from the center or middle of the piece towards the edge. Scrape in the direction of the wood grain and then dispose of the gunk (stripper and old finish) into a container. It’s best to keep paper towels on hand to wipe off the end of the plastic stripping tool as you work. Don’t worry about getting every last bit of the old finish and the stripper off. Just get as much as you can, the rest will be removed when the piece is scrubbed down. Get a bucket of warm, clean water and add some TSP substitute. Make sure you use TSP substitute because it does not need to be rinsed off like real TSP. Follow the directions on the container for how to mix the concentrate solution. TSP is a cleaning solution that helps prep surfaces for paint. With an abrasive scrubber like the back of a sponge or some synthetic steel wool (SSW) it help to remove the remaining paint residue left after stripping the piece. Synthetic steel wool is should not shed like regular steel wool and any particles will not leave rust. If you properly clean, sand and then prime a piece that should not be a problem, but try to use synthetic steel wool if you can. #0 or #00 would probably be best, I just used what I had on hand which was #0000 steel wool (the finest finish). I use a generous amount of the TSP wash and start scrubbing away. The finish on the top of the AOM Dresser came off better and easier than the sides. I think this was because it was harder to apply an even coat of stripper to the vertical sides. Don’t worry if all of the old finish does not come off with the TSP wash, it can be sanded off or at least evened out when the piece gets sanded later on before priming. 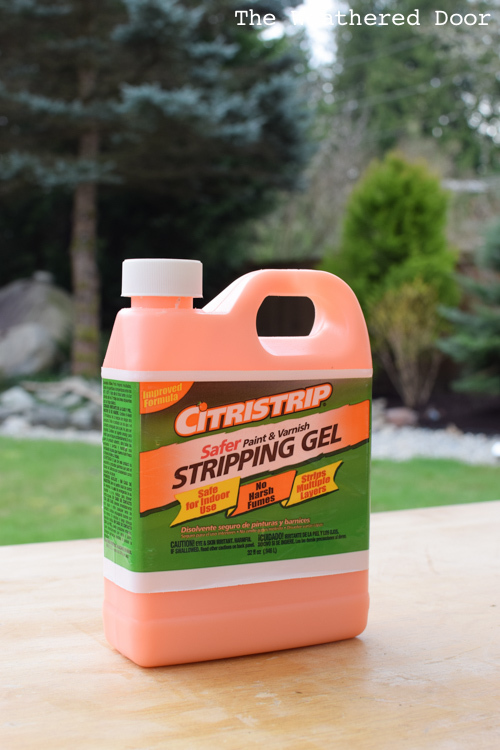 If there is a significant amount of finish left on the piece after using SSW/a scrubby sponge and the TSP wash you would want to apply another application of Citristrip or the stripper of your choice. Make sure to change out the TSP wash as needed. I changed out my bucket of TSP wash 3 times during this process. I used 1 bucket for each surface (right sides, top, left side). 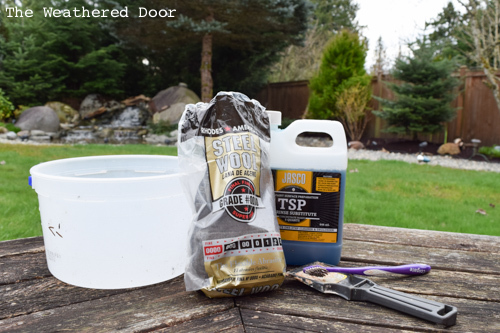 If it’s getting really dirty, get some fresh new water and TSP substitute. I always let the piece dry overnight. That could be 12 hours or 24 hours. You just want it really dry. If the sun is out like it was for me, the piece seemed dry in just 1 hour but I still waited until the next day to move on to sanding it (which will be up next in another video/post on priming). Those are the steps I take when stripping a piece of furniture. Sometimes a few more tools or supplies are needed like an old toothbrush if the piece you are stripping has some detail to get around. I did not strip the drawers on this piece, I only sanded them with 150 and 220 grit sandpaper to even out and rough up the finish before priming. The original finish on the drawers was not as worn and flakey as the finish on the frame of the piece so I did not have to strip the drawers (it would have been a paint to strip those drawers!). I also didn’t strip the legs, those were just sanded like the drawers. If you have any questions or want clarification on part of the stripping process, leave a me a comment and I will get back to you. 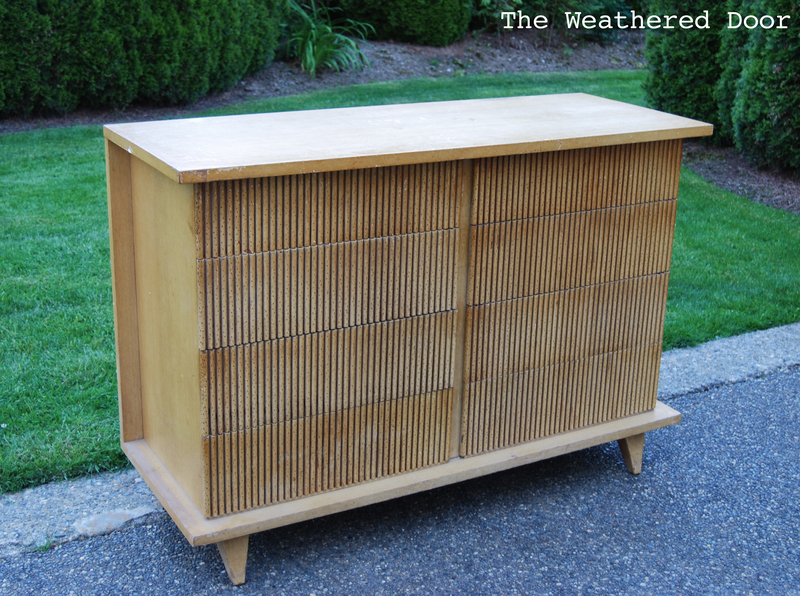 The next parts of this AOM Bamboo Dresser Makeover are coming soon! Let me know if you found this video tutorial helpful and if you would like to see more in the future. Just popped over from One Project at a Time party. Thanks for sharing some great tips … I have an old table that I needs some work. Feel a bit more confident now. This is so helpful! Thanks for the tips, Reeves! Thanks so much for sharing your expertise Reeves! Happy to feature you at our party this morning! This is awesome! Great tips. Thank you for sharing on Found & Foraged. I have found Citristrip to work well on previously stained pieces but not over multiple old paint layers. It tends to almost soak the old paint into the wood. Great for taking off old shellac or stain though! Great tutorial! It surprises me how much work and effort actually goes into paint stripping a piece of furniture. I feel that the end product is worth the time and effort though. Having a nice wooden piece of furniture to either leave wooden, or customize as your own. I would love to paint strip either a bed frame or night stand and add my own personal touch to both. I think this is the best tutorial I’ve seen so far, so thanks for sharing! I just bought a coffee table off a yard sale site and I want to strip it (someone painted it black before I bought it) and stain it a light wood tone. I have never done anything like this and I am not crafty at all, so this will help! You’re welcome! I hope your coffee table project goes well. I’m sure it will turn out beautifully! I’m going to refinish my kitchen table. I will be staining the top of the table and painting the base and chairs. After stripping the old stain/finish off, letting it dry and all of thatl. Before staining is there a something like stain primer or conditioner I should use before or just go right to staining it? A pre-stain conditioner is usually a good idea as it can help prevent spots and uneven absorption of the stain. It does vary by species of wood, though. Some woods still can be harder to work with even after a wood conditioner.